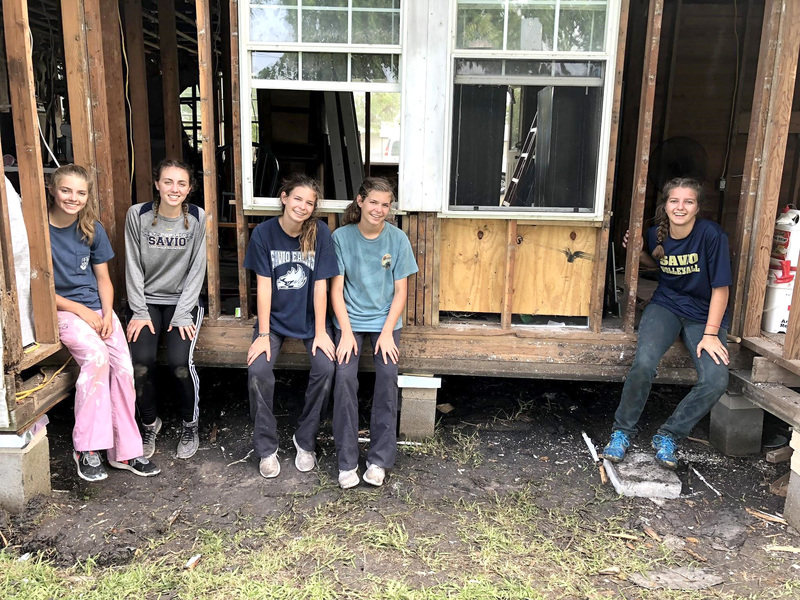 In June, a total of 22 Savio students and three adults traveled for a second trip to Tivoli and Austwell, Texas on a mission to assist with clean up from the 2017 Hurricane Harvey devastation. Tivoli and Austwell are located an hour north of Corpus Christi, Texas. The students stayed in the Austwell Community Center and worked on two houses over the course of four days. The students were guided and taken care of by Rusty and Cindy Bailey, of Rusty Cindy Ministries. Rusty Cindy Ministries is a nonprofit and that specializes in repair and rebuilding homes after natural disasters. The first home the students assisted with, was owned by a 104-year-old woman, Ms. Francesca. 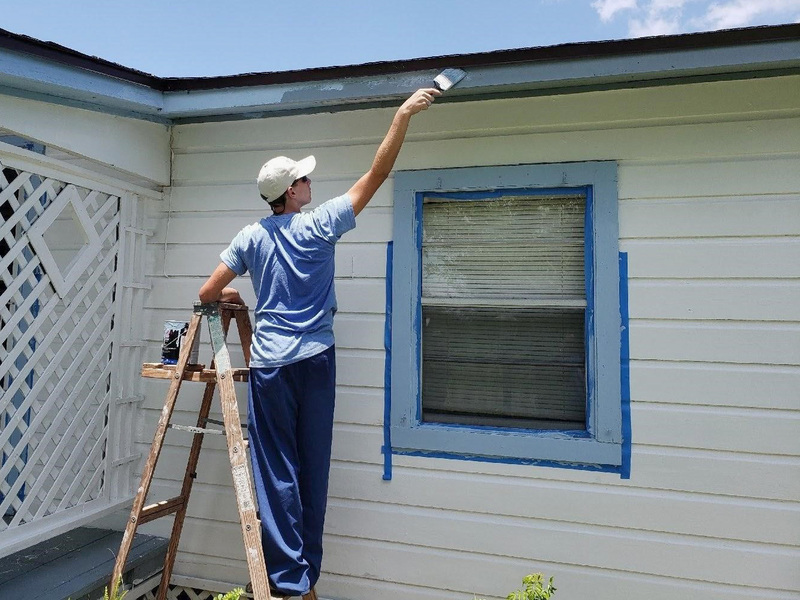 Ms. Francesca needed the remaining paint, scraped off her home and repainted. The students assisted diligently with preparing and painting the home walls and trim. The students also painted her deck to match the freshly painted home. The house looked beautiful when all the work was completed. Ms. Francesca also receives Holy Communion at her home often. 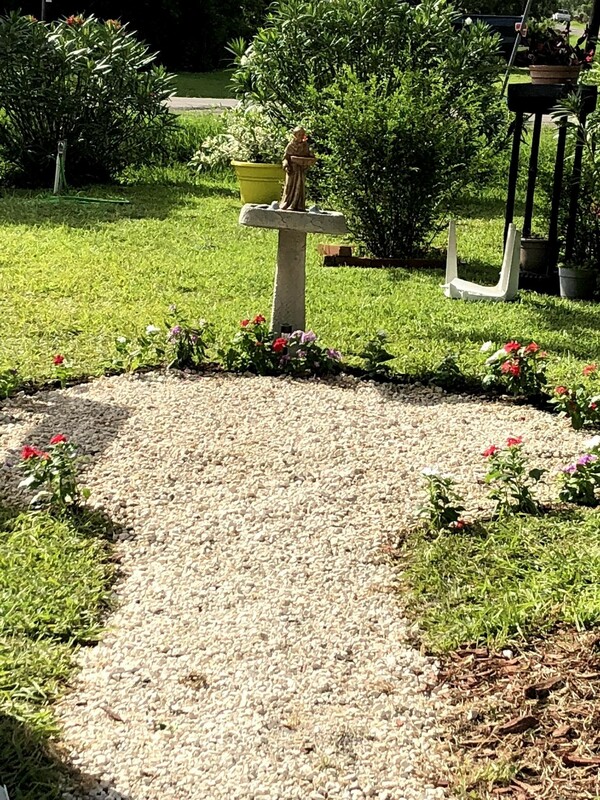 She instructed the students to create a beautiful garden space where she could receive Communion. The students created a lovely garden and trimmed the lawn in the front yard to make the entire space beautiful. The students placed a statue of St. Francis of Assisi in the garden, who is Ms. Francesca's favorite saint. Fr. Paulson Panakal of Our Lady of Guadalupe Parish in Tivoli, visited the garden to hold Mass for all present, and bless the garden. The second home the students worked on, is owned by the Austwell Mayor, Mary Canales. Her home was nearly devastated from Hurricane Harvey and is still a work in progress. Students completed many tasks that required hard work and manual labor. They made much progress on the home to assist with further repairs. the students installed a window, rebuilt an outside wall, installed insulation in the attic, waterproofed and insulated the walls. An exterior wall was removed for repair, as the house electricity was rewired, and trenches were dug under the home to allow more drainage to occur in the future. 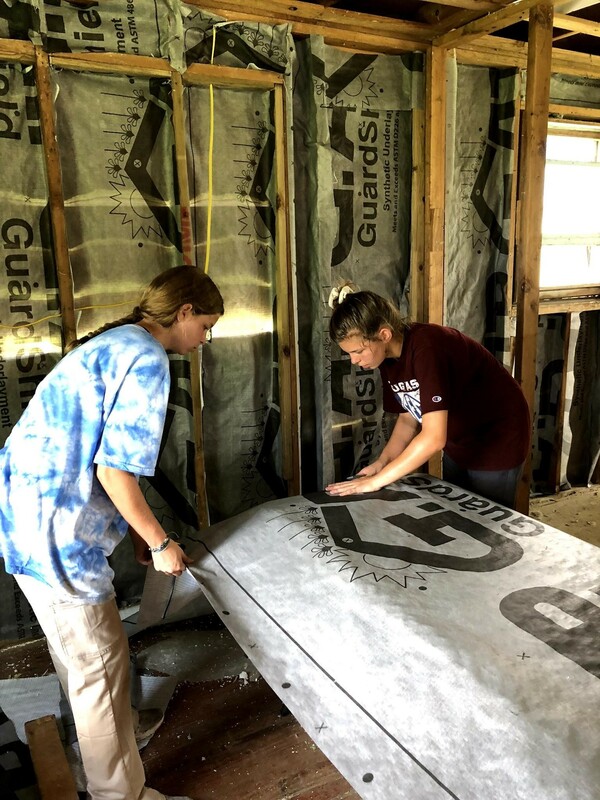 At the end of the trip, the students grew in their knowledge about home repairs, while serving the community of Austwell. They grew in fellowship and were grateful for the experience to serve others in need. Read More about the first Mission trip to the coast here, or connect with Rusty Cindy Ministries on Facebook. St. Dominic Savio Catholic High School is located in northwest Austin, Texas, in an active and thriving community. Savio is a college preparatory school, founded by the Diocese of Austin, to prepare young men and women to become faith-filled, visionary and inspirational leaders in service to the Church and the world. St Dominic Savio offers a faith experience that encourages students to reach their full potential as caring, conscientious, and moral servant leaders. The vision is "Forming Servant Leaders in the Image of Christ." Please contact the Director of Communications for any questions, Mrs. Cristina Almanza by email calmanza@saviochs.org. Savio Senior student, Will Whitaker, was featured on the We Are Austin Lifestyle Show on CBS Austin, Friday morning, for winning the 2018 Texas 4H Food Show theme Fresh from the Farm. Whitaker was named the champion for his delicious recipe, Spaghetti Squash Italiano! View the video to learn more about his accomplishment on the show and find a copy of this tasty recipe on the show page. Congratulations Will! St. Dominic Savio Catholic High School is located in northwest Austin, Texas, in an active and thriving community. 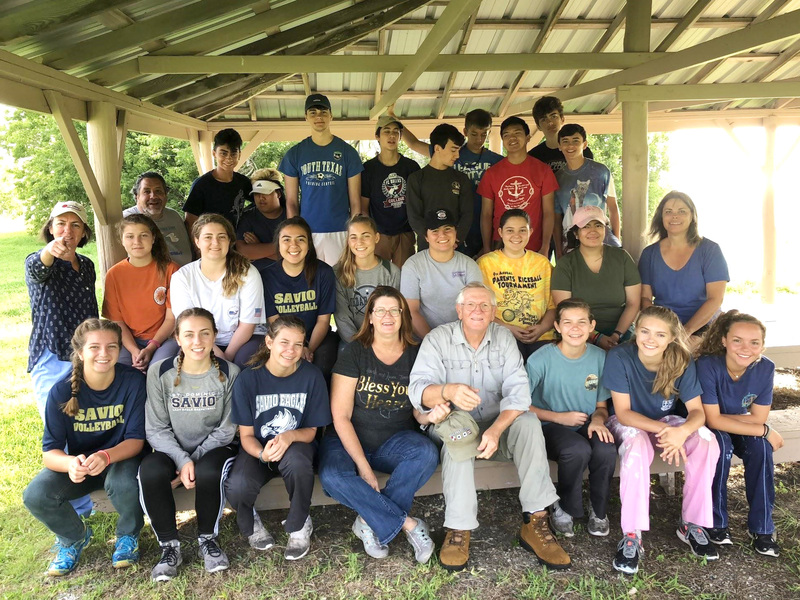 Savio is a college preparatory school and was founded by the Diocese of Austin, to prepare young men and women to become faith-filled, visionary and inspirational leaders in service to the Church and the world. St. Dominic Savio seeks to build a strong community of faith supporting the mission of the school forming well rounded, visionary leaders for the Church and the world. The vision is Forming Servant Leaders in the Image of Christ. Please contact the Director of Communications for any questions, Mrs. Cristina Almanza by email calmanza@saviochs.org.